Club Penguin Cheats by Mimo777 Club Penguin Cheats by Mimo777: Club Penguin Team Personality Quiz! "Red, blue, green, yellow.... 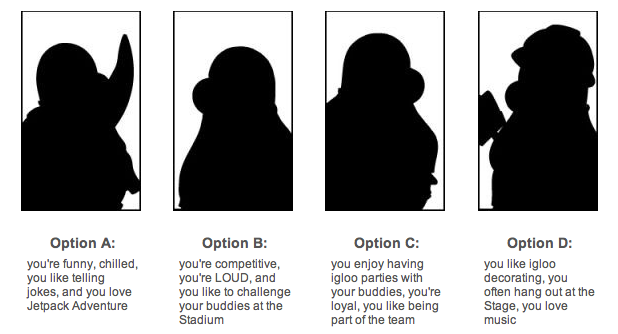 Which Club Penguin Team are you going to join?" Soon, there is going to be a showdown at the Stadium! Many of you weren't sure what team you wanted to be on when Happy77 asked us on Sunday, so Billybob decided to make a quiz. To place your vote click here! In a couple of days, Club Penguin will post the team personality you chose! But I want to know NOW! ;-) Let me know which one you are voting for, k? I am option d! i wonder what that one is? mimo do you want to meet me on cp? if so please tell me when and where and we can play! this blog is awesome! I think which ever one you picked will be in the newspaper saying if your red blue green or yellow.And which ever group you picked will be in the paper saying which group ypur most like!!! I think I'm going for more of an option C, 'cause I love to just hang loose..y'know? I chill with my friends and they love me the same. You chose option D? Nice! About chillin' with Mimo777, you might not be able to personally meet him on Club Penguin..(I mean we ALL do, right?). But you can meet him, just in a huge crowd of penguins. Visit his blog when you can because he holds many parties! In fact, he gives out hints and you gotta solve 'em in order to find out when and where. @Lemons & @masksa You CAN actually meet him personally, when he is taking pictures for a party or a new pin or something. You just have to be on the right server at the right time. But as lemons says,still check back every once in a while, because mimo has his famous Quickie Parties! Check back daily to see if theres a quickee party for Mimo. Or you can find hidden pages to find the party 0_0. My new motto : Supplying you the best and accurate cheats. Nice. And please, mind your caps please. I get it! A is green it's sounds like green puffles (likes Jetpack Adventure). B is like the red puffle (LOUD, challenge at Staduim). C is like the blue puffle (loyal). D is like the Yellow puffle (likes to hang out at the stage).